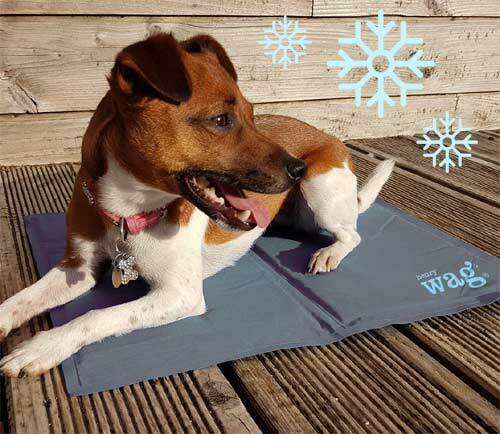 This is the best dog cooling mat we have come across for its combination of comfort, cooling, durability and portability. 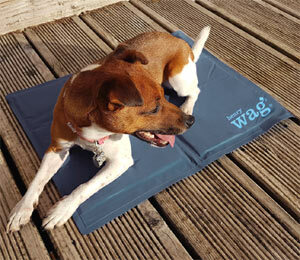 The Henry Wag padded dog cool mat offers comfort as well as a cooling effect as your dog chills out. This new generation of dog cool mat contains innovative cooling gel plus an inner layer of foam not found in most other cool mats. It is the layer of foam and the generous filling of non-toxic gel that make this mat a clear winner. 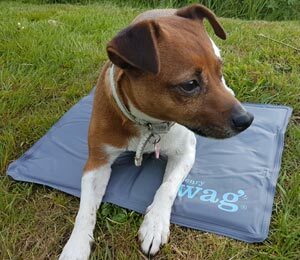 The perfect place for your dog to relax in warm weather - the ingenious gel in these mats absorb heat from your pet's body, cooling them easily and comfortably to slightly lower than their body temperature. No refrigeration required! The cooling effect lasts for several hours, absorbing heat and reducing your pet's body temperature. Once your pet moves around or leaves the mat it regenerates quickly, returning to its naturally cool state. No electricity, water or refrigeration required. Simply unpack and place on the floor, in your dog's bed or in their crate. Within a few moments of resting on the mat, your dog will feel the cooling effects. Can be used indoors or out, away from direct sunlight. Simply the best mat we have found for cooling and comfort - and affordable too! The heat exchange process happens naturally without the need for electricity or any other source of energy. You don't need to add water, place it in the fridge or plug it into the electric. Your dog simply laying on the mat is enough for the magic to work. The nylon outer is smooth and durable. The generous filling of gel beats all other mats we have tried. But we especially love the inner layer of comfortable foam that accompanies the cooling gel. Other mats we have tried either have a hard, flat layer of gel inside offering minimal cooling and no comfort or alternatively a bumpy bed of crystals which only becomes comfortable once they are already warm and liquified. Other mats rely on being water filled, which can make them heavy and prone to leaks. Great for hot days, indoors and out. 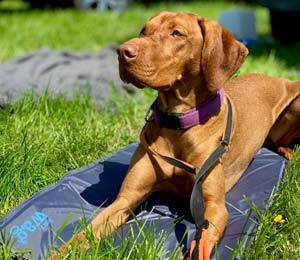 With this deluxe dog cooling mat you have all the best features in one innovative, luxury mat. These mats don't need to be the full size of your dog. As long as their body (chest and vital organs) are laying on the mat, that will cool them. Does my dog need a cool mat? Dogs are prone to overheating and can struggle to keep cool when the temperature rises. They are trapped in fur coats all year round and they can't sweat to regulate their body temperature. Many dogs seek out cool places to relax and will often lay on hard floors in a bid to cool down. This deluxe cool mat offers your dog an alternative, more comfortable place to chill out. 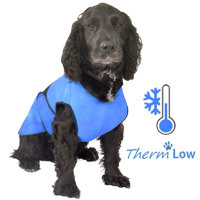 The mat stays at a temperature that is slightly lower than your dog's body temperature for up to 4 hours, depending on use and the surrounding temperature. These mats all work best in temperatures under 30°C. Best placed away from direct sunlight. Made of a nylon fabric outer with a non-toxic gel and foam inner. Wipe clean with a damp cloth. Do not step on the mat or allow it to be pierced. Puncture resistant and durable but not chew resistant and may not survive digging with sharp claws. Supervise use to begin with. If your dog is unsure at first, place the mat in their usual favourite relaxing place and let them discover its coolness.